These videos will show you how easy it is to digitize some gorgeous sunflowers into Redwork using the Digitizing module of the 4D Embroidery software. I will first show you two different ways to digitize the sunflowers in the Digitizing module of the 3D Embroidery software. Both ways work beautiful with the clipart I use from Clipartopolis. The second way shows you what to do if you have difficultly picking up all the lines in a graphic. Then I go on to show you how to edit the digitized design in both 4D Embroidery Studio and in Stitch Editor. Then you can edit any small details and make the digitized design to your perfection. My name is Diane Slachter. 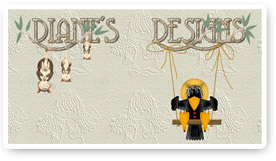 I own the website of Diane Designs Home where I mainly provide Video Digitizing Tutorials on CDs. I do carry a few designs and will have more in the future. I have Video Digitizing Tutorials in the Embird, 3D Embroidery, Pedesign-Pallette, Masterworks,Autodigitizing,Generations, Bernina DesignerPlus software. I have been digitizing over 10 years. I also am the owner of the Yahoo Group The Lace Place, here we concentrate on digitizing skills along with learning our software tools. We also share how to digitize lace for machine embroidery with various software. The members of the group are very helpful to each other.